it makes a neater join. You don't get gaps because it "crowds" the joining stitches together. 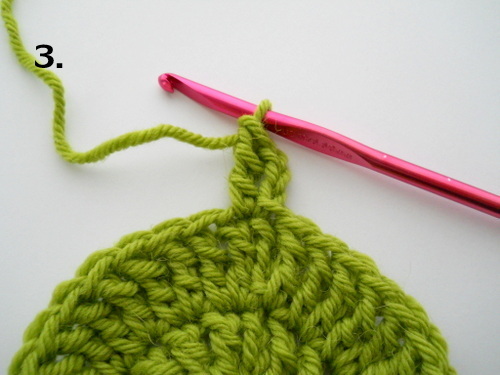 Treble stitch is illustrated, but this method also works well with double crochet. Step 1. 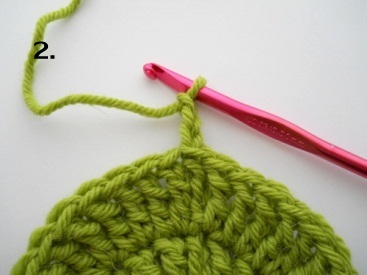 Ignoring the beginning chain, join in the first stitch of the round, as shown by arrow. Step 2. 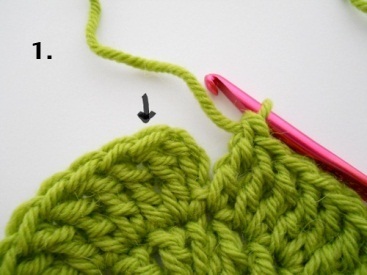 After you slip stitch in the designated stitch, chain up* to begin the next round. Step 3. In the new round, work your first stitch into the first stitch of the previous round. It's the one in which you made the slip-stitch join, and it's right next to the beginning chain. NOTE: My earliest patterns have you work the increases in the slip stitch, as in Step 4, below -- I think it's the most invisible way to go. But, in 2016, I updated my patterns so that increases are in actual stitches -- just to make things simpler. So in the new and updated patterns, only Steps 1-3 are followed. ​Step 4. (During increase rounds ONLY) For the final stitch in the round (when directed by the pattern), work a stitch in the slip stitch. Its place is shown by the arrow, and it's right next to the beginning chain on the other side. When you're not increasing, you follow just the first three joining steps.